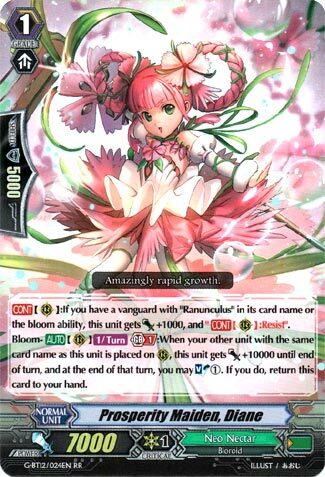 [CONT](RC):If you have a vanguard with “Ranunculus” in its card name or the bloom ability, this unit gets [Power]+1000, and “[CONT](RC):Resist”. Bloom-[AUTO](RC)[1/Turn] Generation Break 1:When your other unit with the same card name as this unit is placed on (RC), this unit gets [Power]+10000 until end of turn, and at the end of that turn, you may Soul Blast (1). If you do, return this card to your hand. Instant Ahsha 4-of Bloom is just the deal-sealer. This unit’s passive +1k power and Resist are a nice bonus when paired with its Bloom ability to grant you easy access to strong lanes. Add to that this card’s reusability via a simple Soul Blast 1 and you have the recipe for a powerful Ahsha support card.